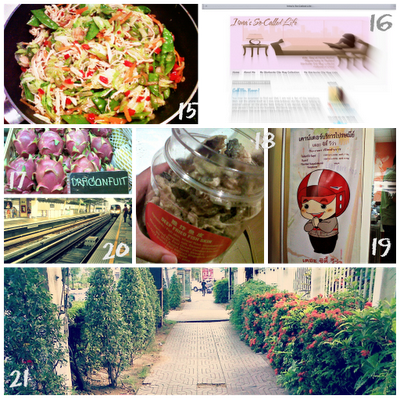 I will keep this short as I need to catch up on so many things on my blog. Bangkok is well known for its street food. It's such a delight to discover the variety of food items the vendors are selling. One can get a complete meal from these different vendors. From our balcony, we can see the intersection of Sathorn and Narathiwas Roads. My little boy likes pointing out the train when he sees it. It was a cloudy Wednesday morning in Bangkok. Little people from the Kinder Chocolate Egg. They are so cute! I am listening to Glee casts Christmas album. Yes to Christmas songs in October. I am Filipino, after all. Christmas starts as early as September where I'm from. We ended up in the hospital as the little boy accidentally poked his left ear and it was bleeding. Thankfully, he only hit the skin and not the ear drum. All's good. 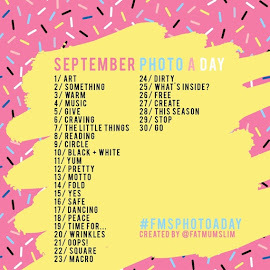 My son gave me an idea for today's prompt when he asked to take a look at our wedding photos. The full moon was absolutely beautiful over Bangkok. Sadly, my phone's camera does not shoot very well at night. This is my favorite piece of clothing right now. My very first top from H&M. These are poke marks my little boy made with his birthday cake. 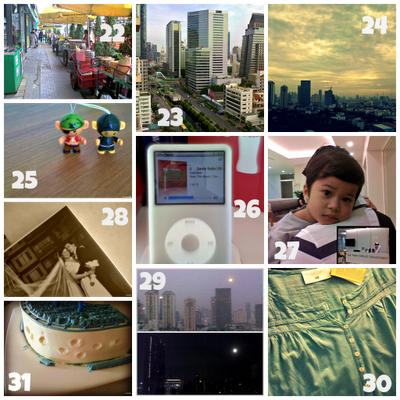 For my complete Photo-A-Day October 2012 photos, do check out my Flickr album here. And just like that we say goodbye to October. Hope yours was an eventful one. 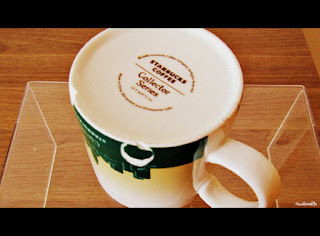 There are ups and downs in joining Starbucks Collectors Group to help my mug collecting. I will deal with the downs in a separate post. For now, I will focus on what makes it worthy. When I reached my first year in the hobby, I listed down all the people who helped me. 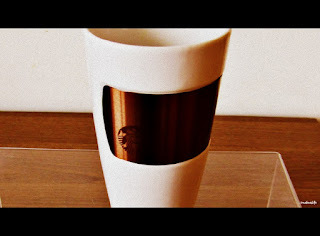 Every time, I see a mug, I remember the person who gave it to me. Each of them hold a special place in my heart. This hobby proved to me that there are people with genuine and generous hearts. 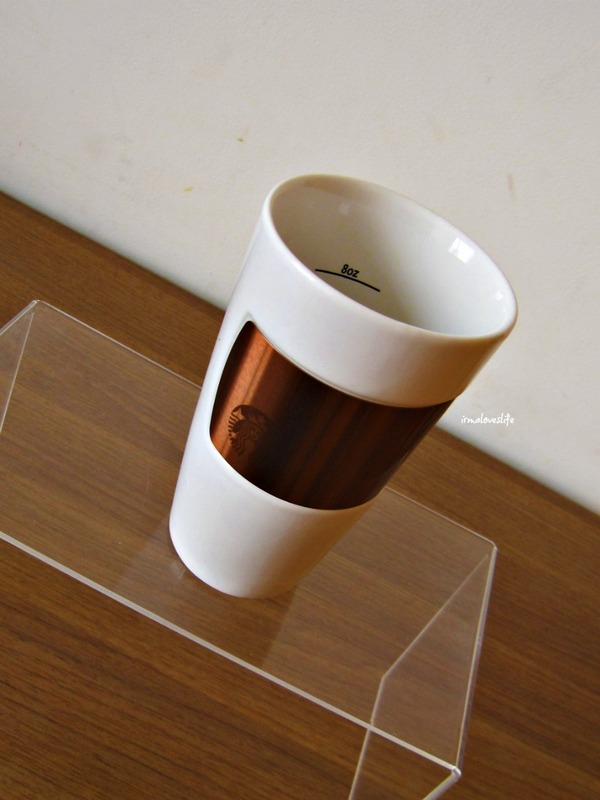 You have to hear the stories of this one collector who lives in a country with no Starbucks and no PayPal (which means she cannot buy from eBay) yet her collection of mugs continue to grow. She really has the best stories and I do hope one day she gets to share them through a blog or somewhere similar. I received two mugs recently and I've considered them very special. 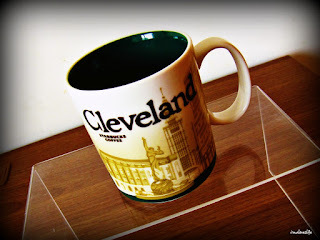 A fellow collector, Dids, had a spare Cleveland mug. Cleveland is a hard to find mug and rumored to be discontinued. On eBay, a Cleveland mug sold for 200USD. Serious business, eh. But this Cleveland from Dids had special needs. It looked perfect this way. But when it is turned around, there are several chips at the bottom. This is the reason why it can't be traded. No one will take it. The value of this mug probably went from 200USD to a dollar. Dids asked me if I would want the mug, and I said yes. I know there are superstitions about keeping chipped items at home, but I never believe them. So this chipped Cleveland mug found its way to our home where it'll be taken care of. I can't explain why I have a soft spot for this mug. 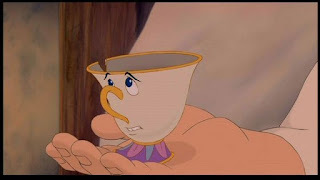 I guess it will always remind me of Chip from Beauty and the Beast. A week after, I found a surprise in the mail. Another collector, this time, from the US sent me goodies. And I received this beautiful white ceramic mug with copper band. It is beautiful. I was very touched with the gesture and the thoughtfulness. 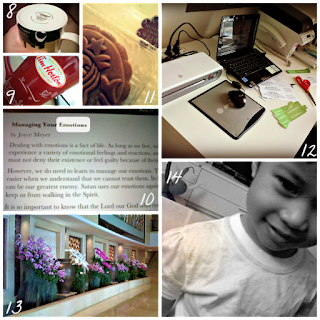 I learn more about thoughtfulness because of this hobby. There are so many ways you can show people you care for them. It's really just the small things. I made so many new friends this year all over the world. It's fun as I try to recall the many countries I sent packages to. In the end, it is the friendship that will last more than the mugs. October is inching it's way. The second week is gone. 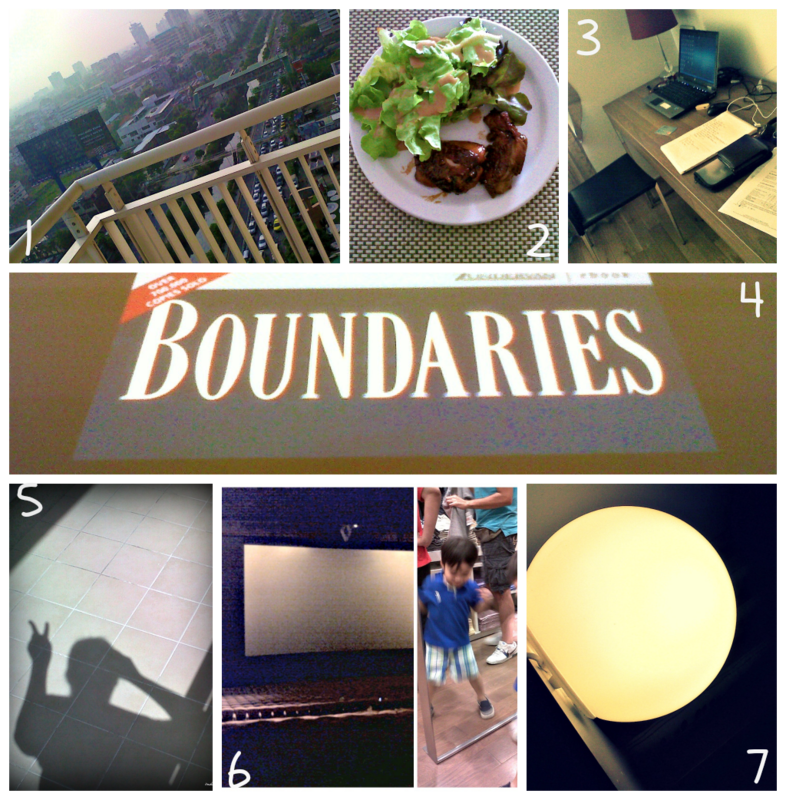 Here's how mine went. From this angle, it shows the flaws of one of my favorite mugs. 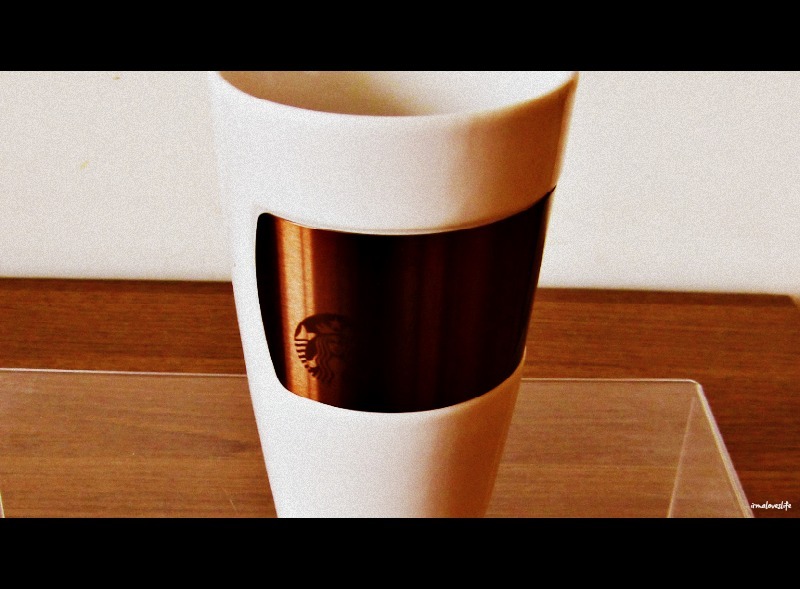 In honor of Canadian Thanksgiving, this mug stands out among all my Starbucks mugs. One of my favorite Joyce Meyer devotional about managing one's emotions. Mooncake from Malaysia. It's hazelnut latte. This is yummy compared to the ones sold in Thailand. This is my home office where I print, scan, laminate and other things. I was working on address labels for my pending trade. This is the lobby of the Shangri-La Bangkok. I love all the orchids and the rich colors. I accidentally bought a ruffled pajama top for my son. And I never noticed. My husband pointed it out to me last night and we were laughing so hard. For the complete set of my Photo-A-Day photos for October 2012, please check out my Flickr album. You may be surprised to find out that I am not a fan of the telephone. Well, not the phone itself as I love smartphones. 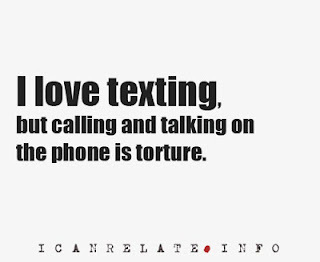 But the act of talking to another person on the phone feels torture. I am serious when I say the only person I talk to is my husband. My family comes next. But we're not phone people. Not even when I live far from them. While reading about the introvert personality, I found out, not being fond of phone conversations is one of the traits. I am a truly a introvert as I read more about it. I am also always unavailable on Facebook chat, Skype, YM. I cannot strike a conversation with just about anyone. I consider it small talk which is my waterloo. It is not that I am incommunicado, there are text messages, BBM, Twitter direct messages, Facebook private messages or even e-mail messages. It's probably the urgency of a phone call and the fact that I am always in the middle of something. However emergency situations are different. I would pick up when I see several missed calls on my phone. So please be assured I am ready to help. 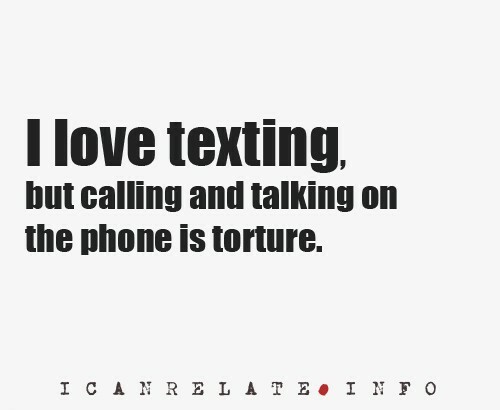 So am I the only strange person who hates the phone? Share your experiences away. I am rushing to catch up with Photo-A-Day recaps. Hoping my blogging schedule will return to normal. Please please please. So I am now on October! The tenth month of the year. 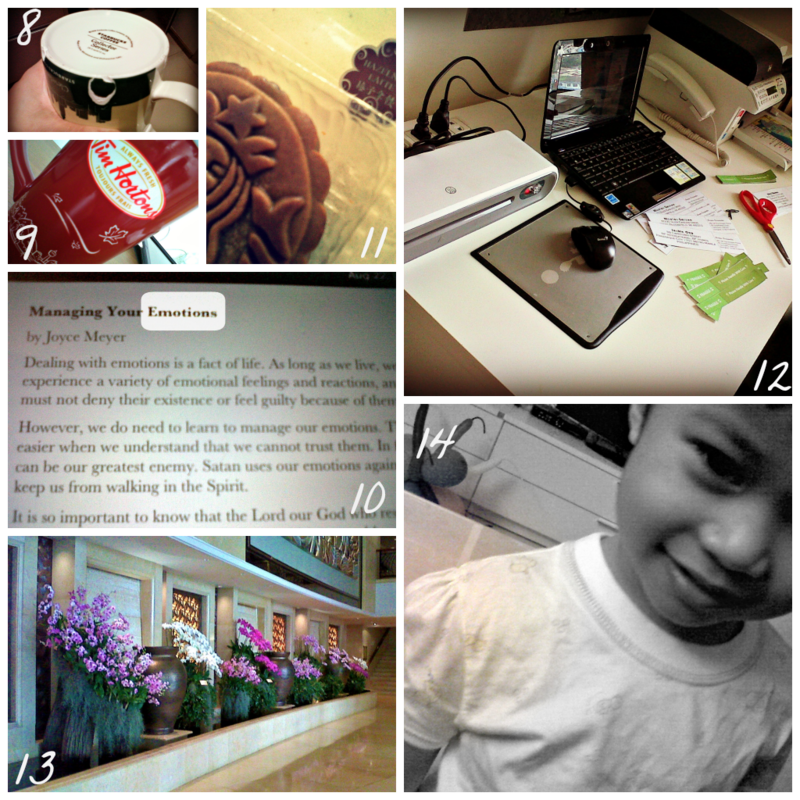 And somehow my favorite as it my little boy's birth month. The view from our balcony on a Monday morning while I hang our laundry to dry. Lunch today is chicken and mixed greens with my favorite sesame dressing. My husband was home sick yet he was still working. It's actually what I'm reading. This book is an eye opener and teaching me it's okay to say "no." This is me taking a photo of my shadow with the bright sunshine as I hang our clothes to dry. Grateful for a wonderful Saturday out with my two boys. My little boy was dancing in very store mirror he finds. While he was napping, my husband and I watched Taken 2 peacefully. Light from our bedside lamp. I find it really soothing. 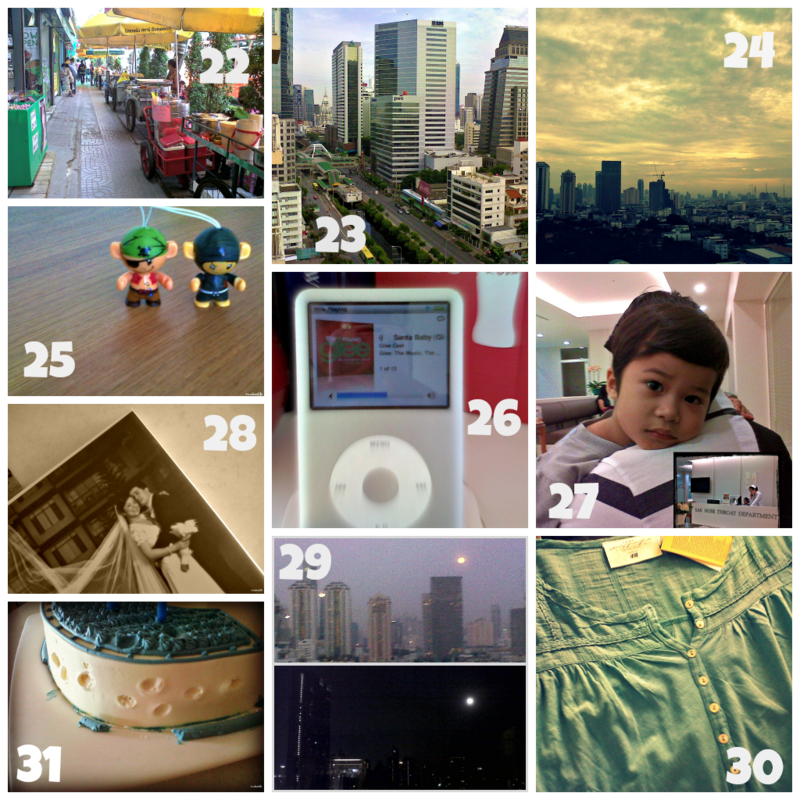 I'm now up-to-date with my photo-a-day recaps. Yay!